Suspects: A Suspect is somebody who is in your ‘Target Market’ however, everyone with a pulse is not necessarily a potential customer. Someone is considered a suspect if at a minimum they have a recognized need for your products or services and they value the types of products or services you offer and you have the capacity to satisfy their needs, and they create good profit for your business. If the people you are marketing to or trying to do business with don’t meet this minimum criteria, stop wasting your time and your money. Prospects: A suspect becomes a Prospect when they respond to your marketing by contacting your business AND you collect their details. By contacting your business, they are confirming they have a recognized need and they believe you have the capacity to satisfy their need. However, it doesn’t stop here. Not every prospect is ready to buy when they first contact your business – that’s ok. Whether you eventually get the sale or not depends on one thing and one thing only – your system for follow up. And the only way you can continue to follow up with this prospect, either directly or through an ongoing drip marketing campaign, is to collect their contact details. Your business will make a lot more money if you invest time and money marketing to people who have already qualified as a suspect, than to do blanket marketing trying to find the suspects. Shoppers: A prospect becomes a Shopper when they buy from you once and you CONFIRM their details. Many business owners and salespeople believe they have secured a loyal customer when they make the first sale hurriedly moving on to close the next deal. This could not be further from the truth. At this point, all you’ve done is communicate value, now you have to deliver it in a way the customer recognizes and acknowledges. This is where the customer measures whether or not you have the capacity to satisfy their needs or not, and you get to measure if this potential customer produces good profit for your business. These factors determine the potential for an ongoing, mutually beneficial relationship. Customers: A shopper becomes a Customer when they have bought from you two or more times. 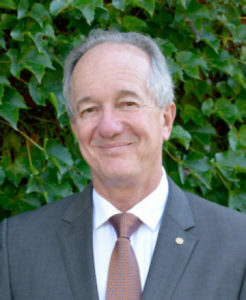 A customer who buys from you multiple times is indicating you have satisfied their needs on previous occasions. However, long term loyalty doesn’t come from customer satisfaction, it comes from customer delight. It is your responsibility that your ongoing products and services create a delightful customer experience. It is also important to continue to market to your existing customers so they are aware of your full product or service offering as well as to show them you care. 68% of customers leave because of perceived indifference, i.e. they think you don’t really care about them. Members: A customer becomes a Member when they join your exclusive and beneficial CLUB and they receive their membership card and members kit. How many of you have a wallet or purse full of cards – gas cards, frequent flyer cards, credit cards, grocery store cards? And how many of you will consistently patron that business, even if it’s sometimes an inconvenience, because of the cumulative benefits you receive, or because you have exclusive rights that come with your membership? The more value your customers receive beyond the direct benefit of the products or services, the more they will buy from you. Advocates: A member becomes an Advocate when they begin telling other people about your business. This is more than passive ‘word of mouth’ marketing. This type of communication is deliberate and intentional, where you encourage your members to talk about your business and your members look for opportunities to talk about your business. This type of communication creates PR ‘buzz’ about your business. 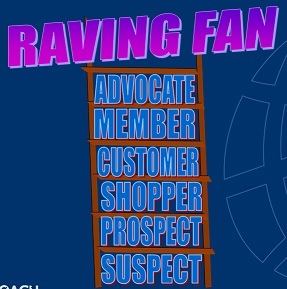 Raving Fans: An advocate becomes a Raving Fan when they do your selling for you. This is more than just talking about your business. Raving Fans generate business for you; it’s as if they have joined your sales team. Imagine you have a sales force of Raving Fans that you don’t have to manage or incur salary of overhead expenses for, bringing you shoppers. You see, by the time somebody who is referred by a Raving Fan contacts your business (usually with the Raving Fan right by their side), they have already decided to buy from you; now it’s your responsibility to turn them into a Customer. I don’t know about you, but I’d much rather my business relationships begin with shoppers who were referred to me by one of my raving fans, than me having to work tirelessly to find the suspects and prospects first.